An overview of the Pulse Tab and the available metrics. 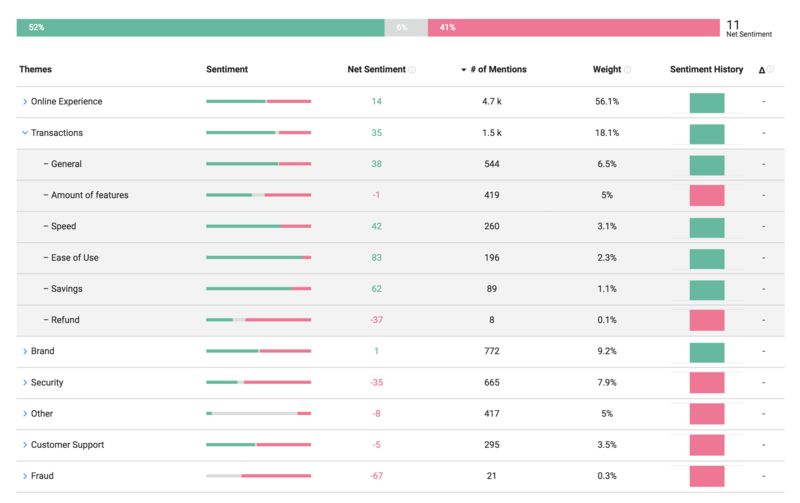 Pulse allows you to view the breakdown of sentiment by Categories and Themes. Sentiment Distribution - Shows the distribution between positive, neutral and negative mentions for a given category and/or theme. Net Sentiment - % of positive mentions / % of negative mentions for a given category/theme. # of Mentions - Total number of mentions for a given category/theme. Weight - Number of mentions / total occurrences. Sentiment History - Shows the performance of a category/theme over previous periods by net sentiment. Tip: Hovering over the chart provides more detail for that historical period. Change - Net sentiment movement compared to last period. N:B - You can also apply Custom Segments to Pulse.